Below is the draft order for the SNES league. 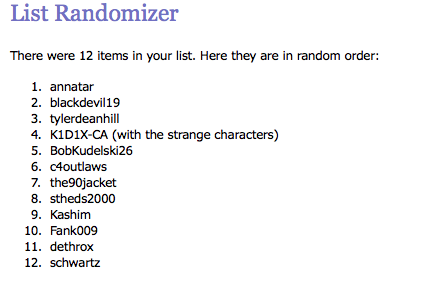 The pick order was randomized (using random.org to generate the randomized list). When it is your turn, reply to this thread to choose your team. You can choose any team that has not already been selected. Below the draft order, you will find a list of available teams. Deadline are set for Thursday, 11/2, in 1 hour increments. All deadlines are in EDT (Eastern Time). If you miss your deadline, your turn will be skipped and you will be given best available team at the end of the draft. Once you have selected, please pass along the message to the next person up via PM, Discord, email, etc to let them know they are up. I'll try to do my best to stay on top of it. You can also post your draft list in this thread, or PM/Discord message me (chaos) the list if you don't want to post your team selections. I'm 3rd, I'll take Pittsburgh, and if BD picks them, Ill take Boston. That way, you can have the Caps, unless Kid picks either of those teams. stheds2000, or Gorecki as I call him, gets Winnipeg. Time to get back to my roots - HFD please. I'll take the Canadians of Montreal ! It's all good. You could have taken Washington. I wasn't picky on which team I get. I was seriously thinking about taking Anaheim. It’s all good. I’ve used Washington in classic before so I’m happy to try something new.